The MRMC Patient & Visitor Resources guide assists patients, families and visitors with locating short or long-term lodging accommodations as well as other resources for visiting the medical campus. Only long-term closures will be in effect. Employees and visitors to the MRMC campus are encouraged to use Watertown Plank Rd. to access 87th St. to avoid potential delays. Beginning April 29th, traffic on both Doyne Ave. and William Coffey Ave. between 87th & the Froedtert Emergency Entrance will be restricted to one lane in a clockwise direction for the reconstruction of those intersections. See attached graphic. The Medical College main entrance off 87th St. from the north is open (entrance only). Exit via Connell Ave.
Vehicular access to and from the Medical College is available via Connell. Through summer, traffic shifted into a new pattern as shown on the graphic below. From the north: at Watertown Plank Rd/86th St.
From the south: off Connell Ave.
Center access is exit only. Traffic enters off Connell Ave. and exits through the parking lot south of the Eye Institute. Drivers are using the two new driving lanes that have been constructed between Wisconsin Ave. and Connell Ave. Note: The right lane heading north on 87th is dedicated to only turning into the Sargeant Health Clinic at Doyne. Use the sidewalk on the west side of 87th St., north of Doyne. Use crosswalks at 87th and Connell Ave. Phase One of the parking structure is open and parking on the surface lot is closed. Shuttle service for Froedtert employees is available. Surface lot parking for patients at Sargeant' Health Center remains open. 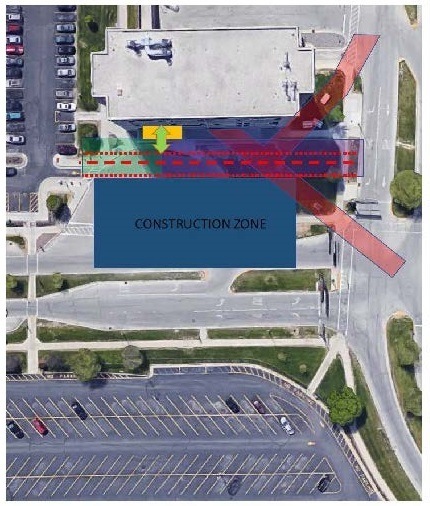 Pedestrian access to the Sargeant Health Center parking lot is near 87th & Doyne Ave. The S-4 service drive will be closed until early May to accommodate work on the Children's Hospital skywalk. For the best route to campus, download the "Travel MRMC" app on an iPhone or iOS device. The Travel MRMC app offers the most accurate and up-to-date driving directions for travelers en route to the MRMC campus. The app considers long-term and/or temporary construction closures as well as traffic delays when producing the best route. No other app or GPS navigator can offer this level of detail. Take I-94 west (toward Madison) to I-41 north. Take exit 305B. Go north on I-41 (toward Fond du Lac). Go east on Watertown Plank Road and take exit 40. Take I-43 south (toward Milwaukee). Take exit 10 to I-94 west. Follow I-94 west (toward Madison) to I-41. Take exit 305B. Take I-43 (Rock Freeway) to I-41/I-894 north. Take I-94 east (toward Milwaukee) to I-41 north. Take exit 305B. Take I-94 west (toward Milwaukee) to the I-894 bypass (Madison/Fond du Lac). Take exit 316. Follow I-894 north to I-41 north. Download the Travel MRMC app for iOS devices so you can find the best route to the best care. For most hotels, it's best to call to request a hospital or MRMC facility patient rate. For online reservations, use the special booking link if provided. All rates are based on availability and may change without notice. This information does not represent an endorsement or referral to any of the lodging facilities. Guests at these lodgings are accepted by referral from a health care professional familiar with the patient. Rooms are available on first come, first served basis. Contact the organization for further information. Access the Blood Research Institute off Watertown Plank Road or 87th Street. For more information, visit: http://bit.ly/1EHewRh. Children's Hospital provides free parking for patient families and visitors north of the hospital and clinics. The skywalk on Level 2 connects both buildings. CHW offers free valet parking Monday–Friday. (Check signs for hours. No service on holidays). For more information, visit: https://bit.ly/2FmD8Hp​. A no-charge parking lot is provided for MCW visitors and may be accessed from 87th Street. For more information, visit: https://bit.ly/2FhVBpe​. Access parking off 92nd Street. For more information, visit: https://bit.ly/2M0p5IK​. Note: Inquire about special rates. Wheelchair-accessible transportation available. Access parking from Watertown Plank Road. Parking Area 1: Enter structure from 92nd Street. Parking Area 2: Enter lot from Doyne Avenue; parking is under Cancer Center Building. Parking Area 3: Enter structure at 87th Street & Doyne Avenue. Parking Area 4: Enter from 87th Street. Parking Area 5: Enter from Doyne Avenue; parking is under the Center for Advanced Care Building. For more information, visit: https://bit.ly/2VHYHYt. The Wisconsin State Fair Park (640 S. 84th Street) houses Metro Milwaukee's only year-round RV park. Enter at Gate 6 or 8. Visit http://bit.ly/1JnsfNK for more information.